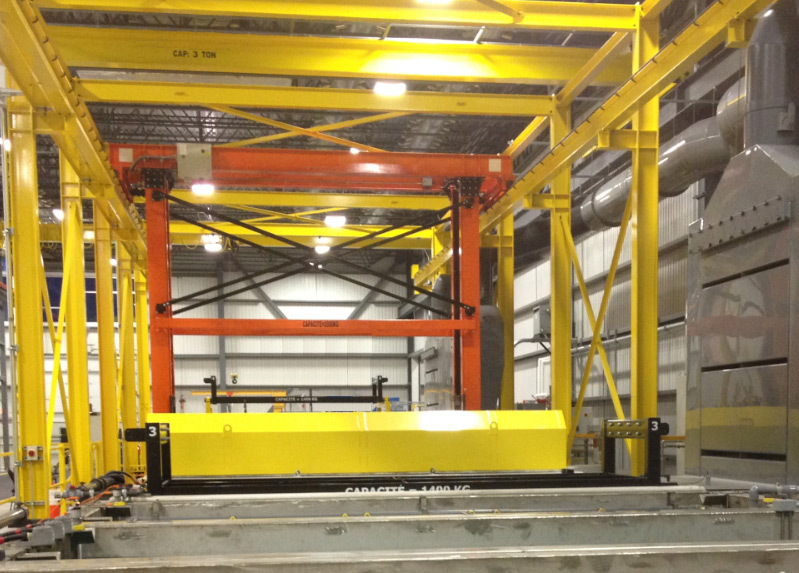 RSTech can provide control systems for single or multiple hoist systems. Program control can be adapted for the end user as a simple fixed cycle or a complex multi-cycle. 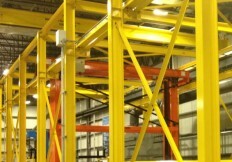 Our fixed cycle hoist control system can be used for single or multiple hoist systems. The fixed cycle system runs the same recipe, or set of movements, over and over again. 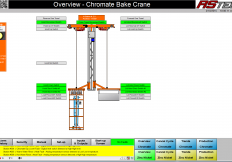 The recipe, which is fully programmable by the customer, commands the hoist where to go. 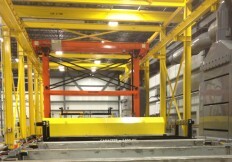 For example the hoist may lift, lower, move to station x, tilt, or agitate. 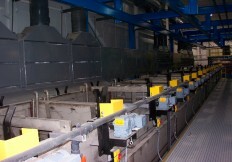 This system is typical for lines where batching or continuous processes are used. 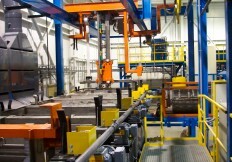 Some of the advantages of a fixed cycle system are cost since the programming is less intensive and processing speed. 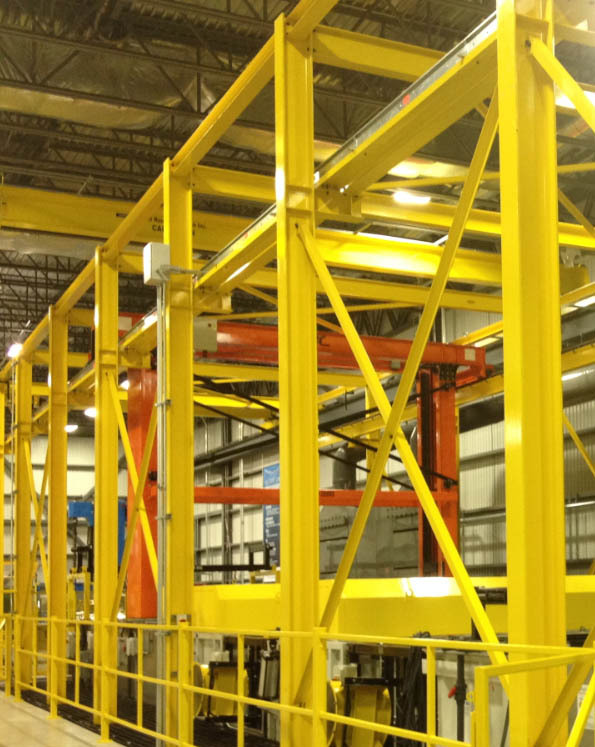 Our multi-cycle hoist control system can be used for single or multiple hoist systems. The multi-cycle system can process multiple, different recipes at the same time. 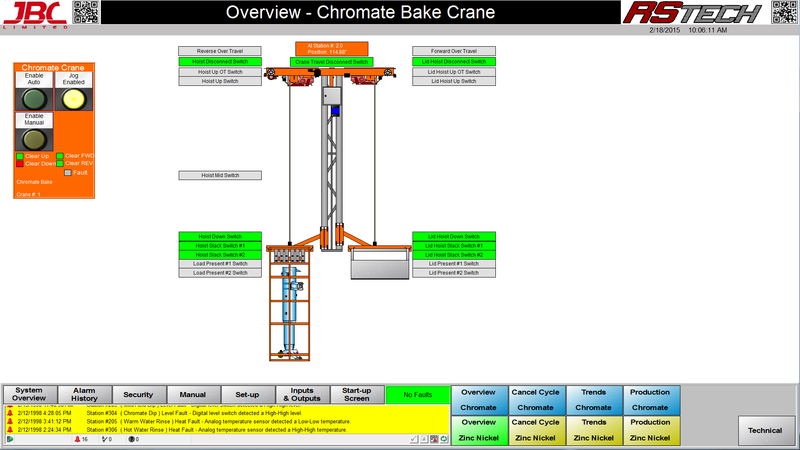 The recipe, which is fully programmable by the customer, commands the part where to go, not the hoist. For example the part may move to station x, lift, lower, agitate, tilt, etc.. This system is typical for lines where custom processes or small orders are used. The biggest advantage of a multi-cycle system is flexibility. You don’t need to clear out the line to select a different recipe. Whether your system uses a fixed cycle or multi-cycle, recipes are the back bone to the automatic cycle. 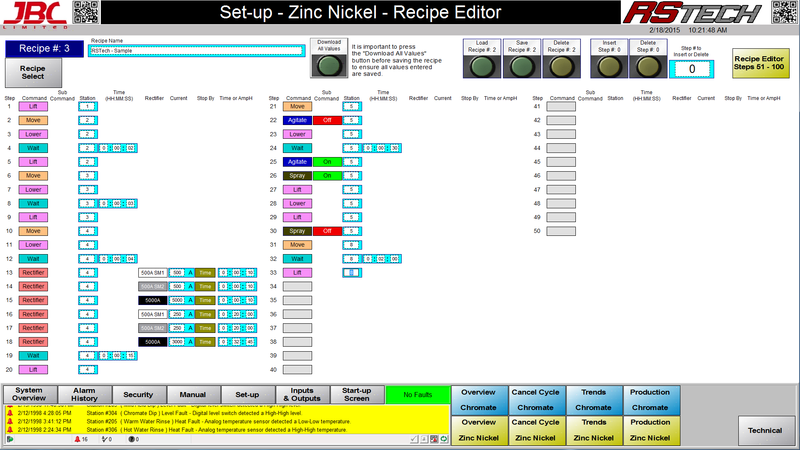 Our systems include a recipe editor that allow you to program the recipe without having any programming knowledge or experience. We have made our interface simple and intuitive so you don’t waste time on recipes and can instead concentrate on your process and operation. 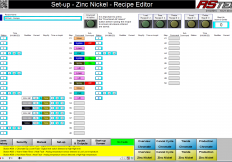 The recipe editor allows you to save, recall, copy and delete recipes. Need to add a step half through the recipe? No problem you can simply insert (or delete) a step at any point in the recipe. All recipes are assigned a number (kind of like an ID) and an alpha numeric name that can be modified by the Operator. 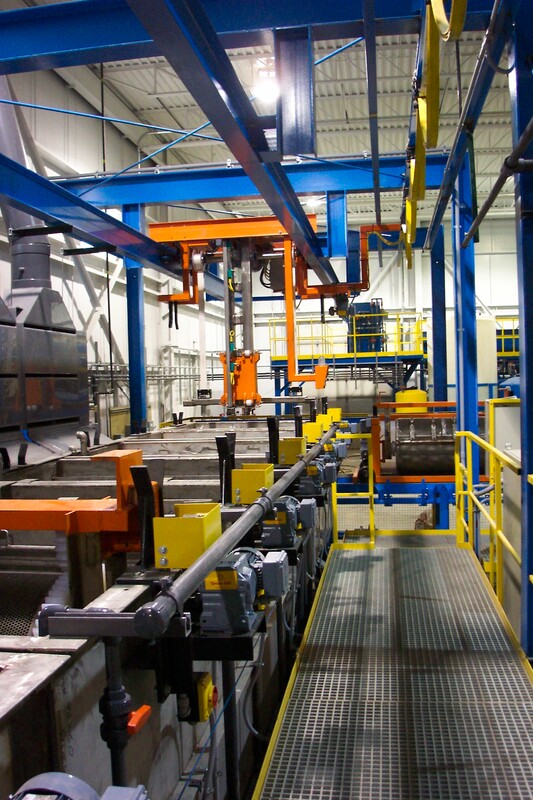 Control of process equipment typically goes hand-in-hand with a hoist control system. The hoist system already requires the use of a state-of-the-art control system including a PLC and HMI so why not use that power and performance to monitor and control additional process equipment. 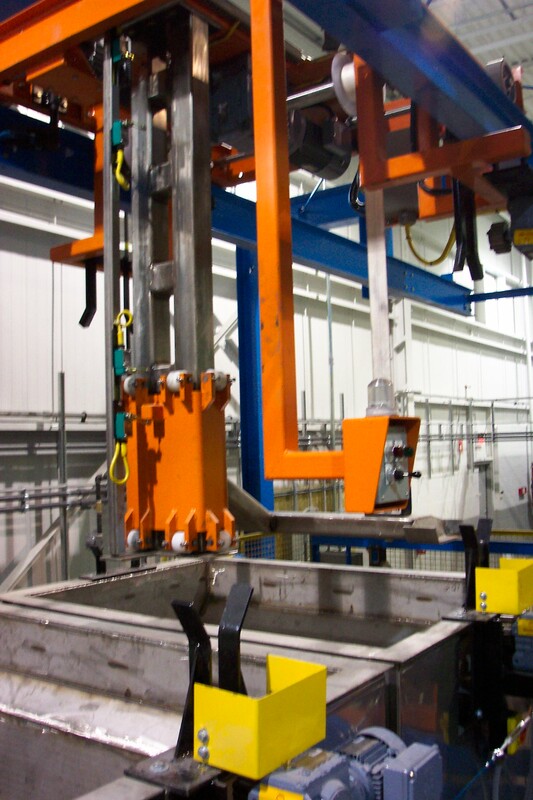 In addition to automatic and manual control of process equipment, these devices can also be integrated into the hoist recipe system when required. For example if you want your agitation pumps to turn off prior to the part being lowered into the tank to avoid “sailing” or you want a spray pump to start when the hoist lifts a part to a certain height. 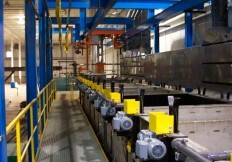 Level – The level of liquid can be controlled and/or monitored by the control system. RSTech can provide discrete level monitoring utilizing individual level sensors such as High level and Low level or analog level monitoring that use devices that provide a specific measurement such as 4.2″ from top of tank. 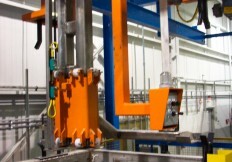 Analog systems allow for programmable thresholds that can be easily changed from the HMI terminal. Need your tank level just a little bit higher? No problem, simply enter your new threshold at the HMI with no need to worry about moving or adjusting sensors. 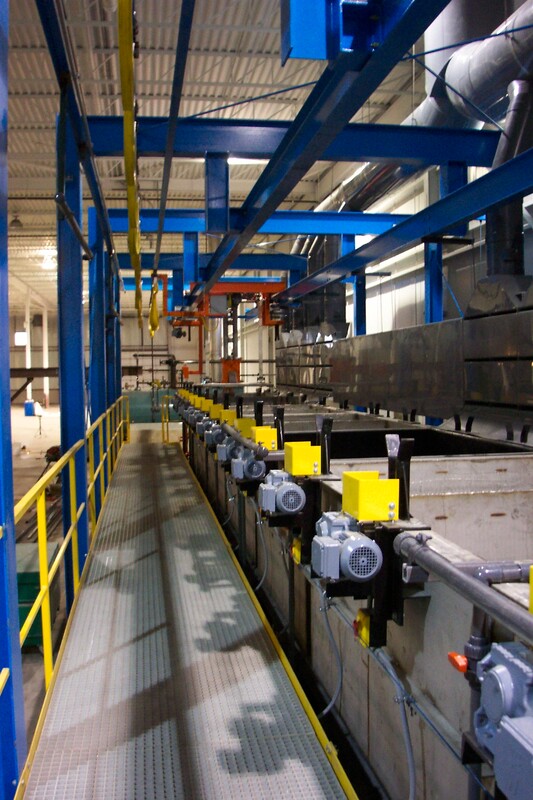 Level can be controlled by activating solenoid valves, pumps, or proportional valves for more precise control using PID (Proportional Integral Derivative control). Temperature – Whether your systems uses steam, gas, a boiler, a burner, or electric heating elements, RSTech can control them. Temperature is monitored using temperature sensors such as thermocouples or RTDs and connected directly to the PLC using temperature input modules. We can apply PID loops or on/off control to your system. Temperature set points are easily changed at the HMI terminal. Pumps – We can control and monitor pumps in the system regardless of their purpose. We monitor auxiliary contacts and overloads to alert the Operator when there is a problem. Critical pumps often have additional monitoring systems such as current transformers (CTs) to monitor the current of the motor and/or flow and pressure sensors to monitor incoming and outgoing pipes. Large pumps can be eased into operation through the use of variable frequency drives (VFDs) or soft starters.